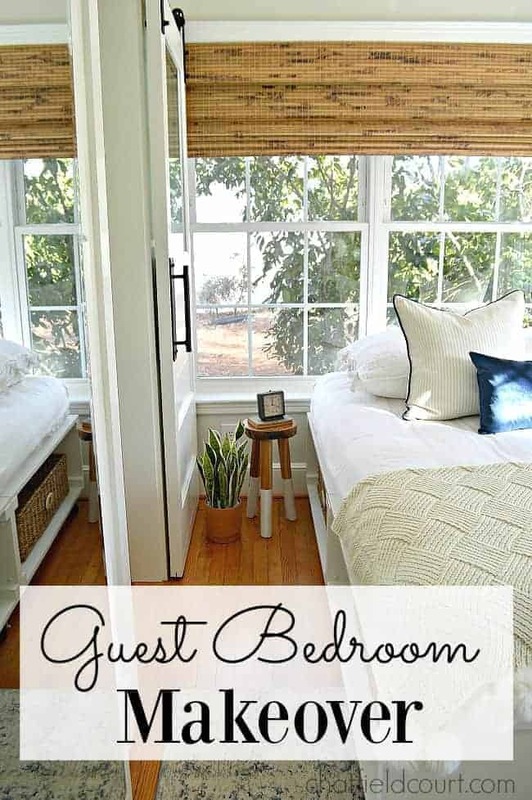 A guest bedroom makeover update and easy decorating ideas for a small space. I bet you thought I’d never finish this room. Actually, I thought I’d never finish this room and, although I can’t call it done, it’s getting there. This is a sponsored post written by me on behalf of Select Blinds. All opinions are 100% my own. We’ve always referred to this small space, in the front of the cottage, as the blue bedroom. Blue, not only because of the paint color, but also because it was a sad little room (with so many issues). When we moved in, this space had a poorly built bookcase on one wall, the ceiling light fixture is (way) off-center, the walls haven’t been painted in years, the blinds were dirty and broken, the door knob was hanging on by a thread and the door and woodwork were all chewed up from a previous homeowner’s dog (we think). We needed to address all of those issues, but the first big project we tackled in here was the powder room that we built in the closet. 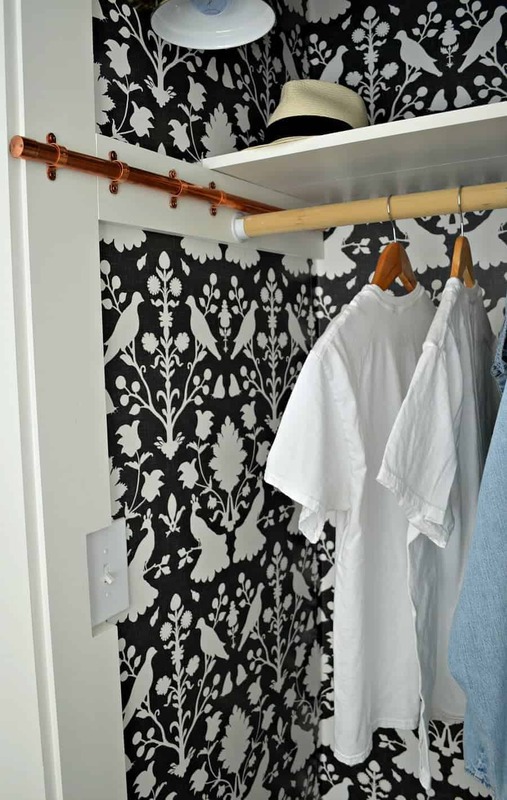 Yes, we turned a little closet into a tiny, little powder room. It just has a toilet and a sink but when you only have one small bathroom, getting a second toilet is almost like winning the lottery. We love this space and it was definitely worth the time and effort it took to build it. 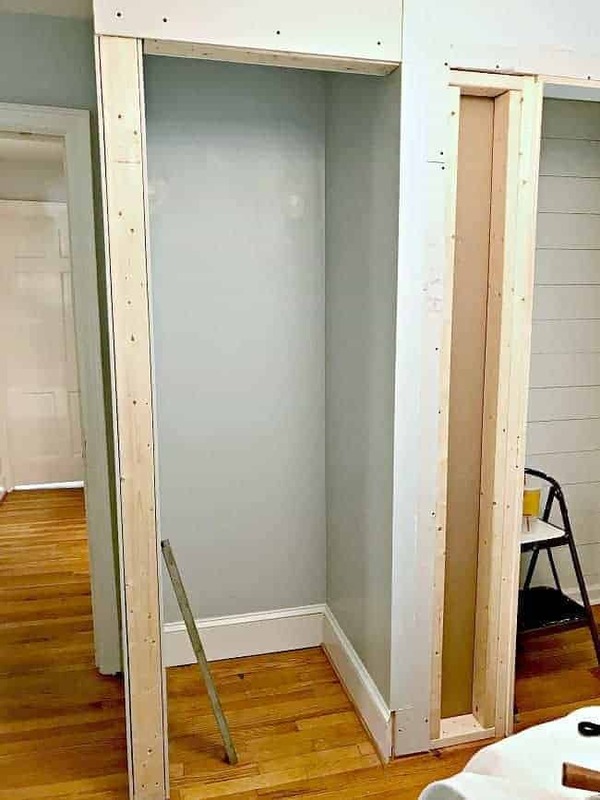 Because we took away the only closet in the bedroom (when we built the powder room), we had to build a new one. It’s tiny but there’s plenty of storage space for my husband’s clothes and it has a pretty little surprise inside. I love sliding the door open and seeing the pretty wallpaper that we hung. I was so nervous about using wallpaper but it was the right decision for this space. Something totally unexpected. Another unexpected bonus is the DIY copper sliding clothes rod that I built. So easy, yet so handy. I use it almost every day to hang my clothes. Once we finished the powder room and closet, the makeover came to a halt. We got busy working on Minnie and didn’t really give much thought to the guest bedroom. 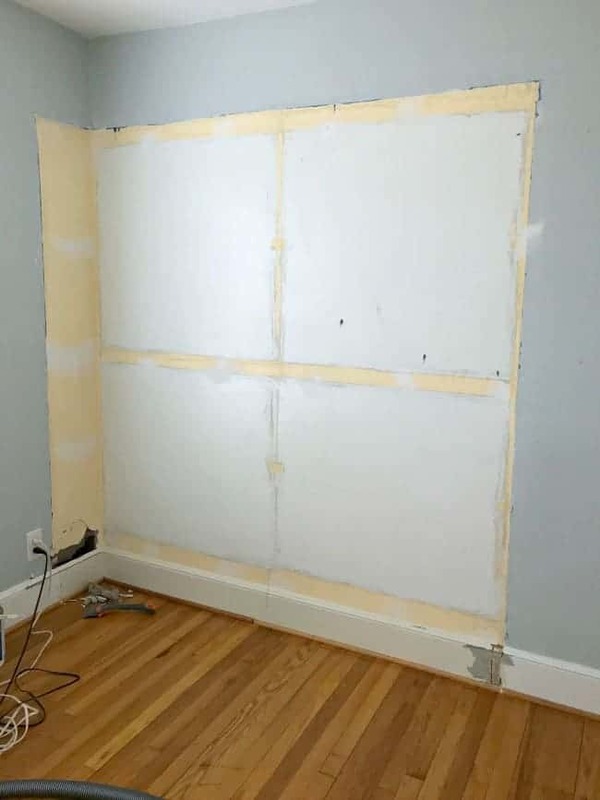 By the end of August (2018), I had gotten tired of seeing the mess in the bedroom, and the big hole in the wall (more on that later). I decided that I was going to do whatever I could to finish up the room. The first thing I needed to address was the elephant in the room. Err…the hole in the wall. Before we moved in I decided that the ugly, badly built bookcase had to go. I removed most of it and asked the hubs to remove the last board that was giving me trouble. “Be careful” were my parting words before I went into the kitchen. I just remember hearing a loud crash. The hubs tried to kick the board loose and it went right through the plaster wall. The board came loose but now we had a big gaping hole in the plaster to fix. The hole sat there, untouched, for two years before it was finally fixed. I also had to fix the wall where the bookcase stood. There were holes and thick pieces of wood putty all over the walls and floor. It really was a mess and it took me quite a while to fix all the damage. Anyway…once I got the wall all patched up and sanded, I was able to finally throw some new paint up. I went with a light gray (see source list at the bottom of the post). I also gave all of the trim, windows and door a fresh coat white paint. Just painting the walls made a huge difference in this space. I knew that the light blue was bad but the new paint really brightened things up. After the painting was done, it was time to address the faux wood blinds. They’ve seen better days so it was time for them to go. We’ve replaced most of the blinds in the whole house with woven shades so that’s what we went with in here. I worked with Select Blinds for this project and picked out the perfect shades for our new and improved space. Like my other shades they have a blackout lining and continuous loop cord so they are easy to lower and raise (key when you have a big window). I can’t tell you how much I love them! 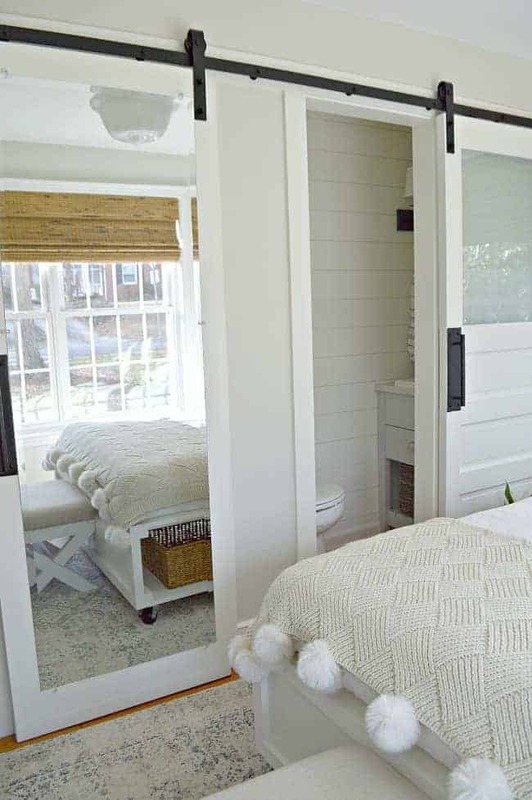 They add warmth, texture and some much-needed style to this small bedroom. Plus, they were really easy to install. With the walls and windows complete, I started to rethink the purpose of the room. Originally, I was going to use it as my studio, a place for me to do projects and take pictures. I even moved all of the furniture around (and sold the bed that we had in here). After moving the furniture around though, I decided to use the other guest bedroom as my studio and this one as the guest bedroom. 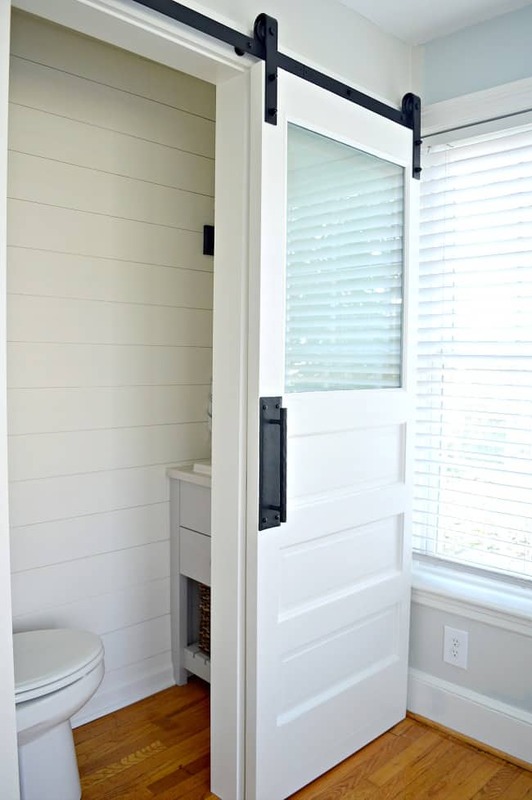 It really made more sense because the powder room in this space would be easily accessible for our guests. Happy with my decision, I shuffled the furniture around for the last time. Our DIY platform bed made the move, and we added a pretty new rug. The “blue” guest bedroom was now officially the “new” guest bedroom, and my studio would be in the “castle” bedroom. It’s the perfect arrangement. The hub’s uses the guest room as his dressing room so the dresser needed to stay. The paint was in rough shape, from construction on the powder room, so a new color was in order. 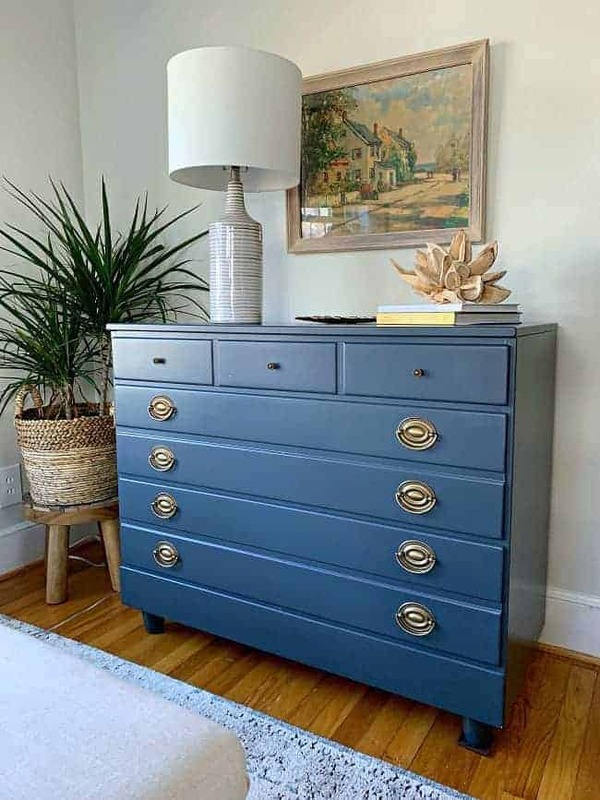 This $5 Goodwill find got 4 feet and new hardware a couple of years ago, so all it needed was a fresh coat of paint. Navy blue was the perfect choice. 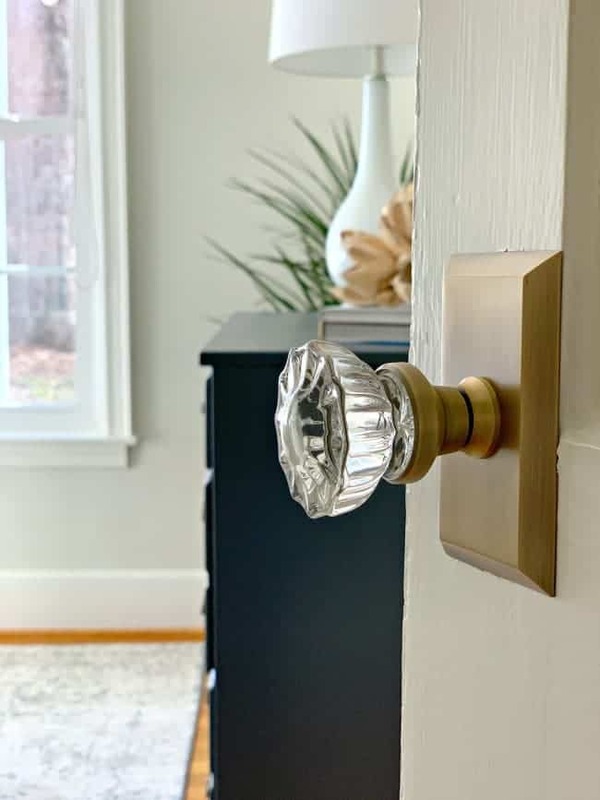 I love the rich color with the aged brass of the vintage hardware. All I need to do is find that perfect lamp. I’ve been searching for awhile but can’t find the perfect one so this will have to do until I find “the one”. 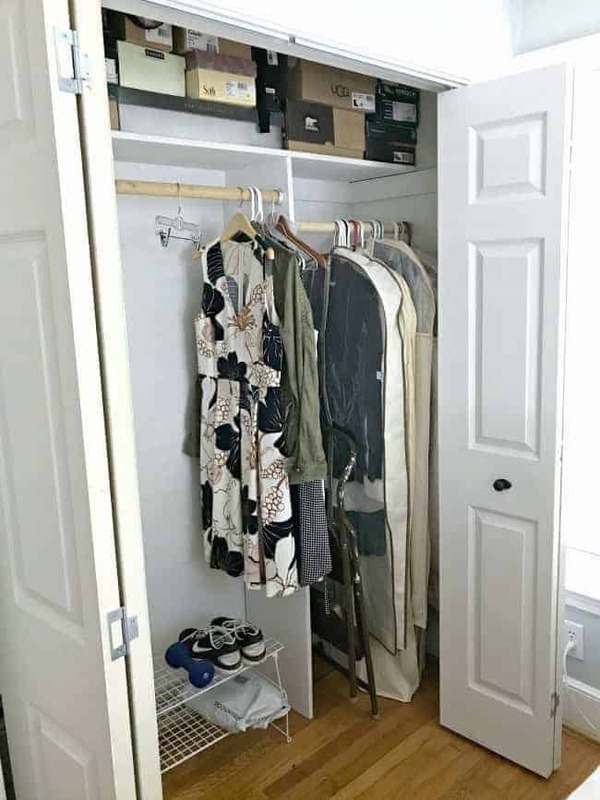 I’ve gotten a lot of questions about the powder room and closet doors opening and closing so I thought I’d try to explain. We can’t open the closet door all the way when the bathroom door is closed but the bathroom door is usually left open (unless someone is in there). We installed a “stop” on the bathroom door, so it can only close so far (enough to shut in the bathroom doorway), and a “stop” on the closet door, so it doesn’t go any further than the outer edge of the bathroom doorway. That allows us more than enough room to get in the closet. It has really worked out well and we haven’t had any issues. Hopefully this helps explain the workings of the new doors. We still have a few projects to do in this space before we can call it done. We need to address the off-center ceiling light fixture and install the crown molding. I’m not sure when those projects will get done but they are at the top of the list. Hopefully it won’t be 2 more years. 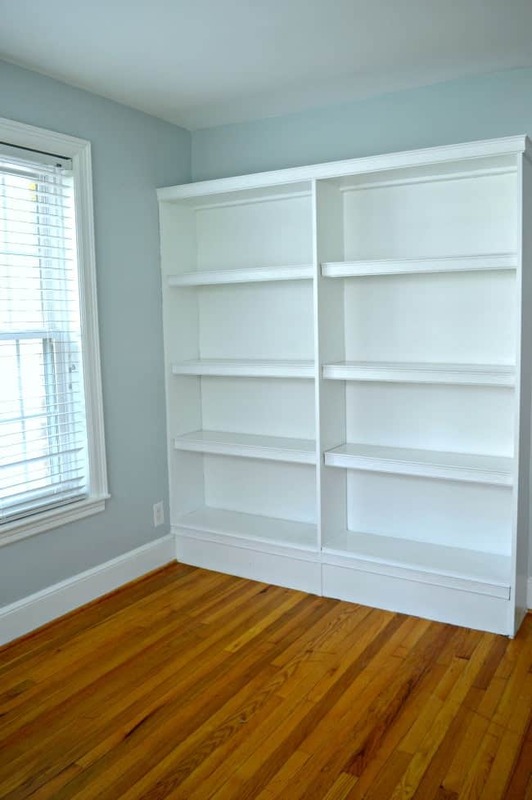 My studio is the next room on the list – after the light and crown molding. I’m still working on a plan but I have most of the furniture and some decor already worked out. I can’t wait to share it with you. I’m going to enjoy my new guest bedroom for a few minutes though, before I start the studio. What an amazing makeover!!! Any guest would be lucky to stay in that sweet room. Drooling over the pom pom blanket!! 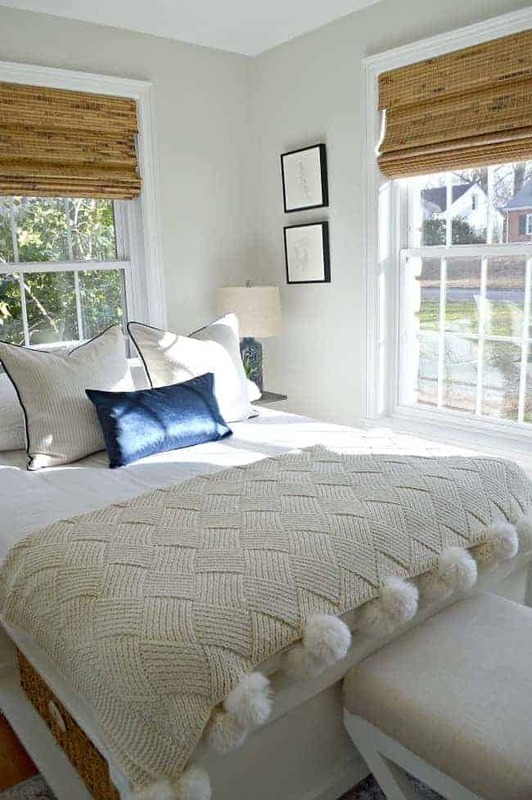 Your guest room is a beautiful and inviting space. The blinds are a nice addition of texture. I need some for my guest room and have been looking for some with a liner since they are visible from the street. What color blind did you select? Your pictures are much better than the one on the blinds site and I believe I will order the same color. That’s so sweet, thanks so much Kim! I’m really loving the new shades. I’m so glad that I went with them and not blinds (I get so much more light in during the day). I chose the Premier Woven Wood Shades in Quince. I also added a white blackout liner (I didn’t want to go with a darker color because it fades in the sun). You can also order samples in colors that you might like. That’s really helpful if you’re unsure. Hope this helps. If I can answer any other questions, don’t hesitate to ask. Love your cottage, Krisyi, but unable to visualize the whole layout. 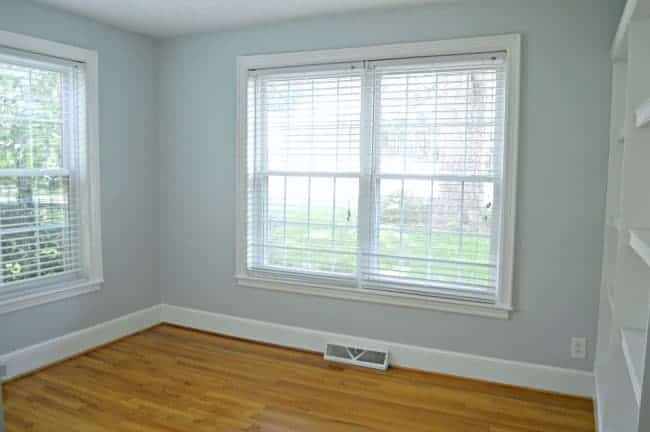 Is new guest room to right or left of living room (with kitchen behind)? Rough outline of floor plan would be greatly appreciated. Beautiful, light filled space! Lucky guests! And that Pom Pom throw is just adorable. 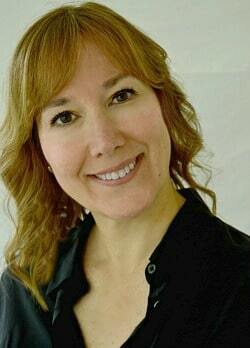 Hi Kristi, well I’d like to book a stay in your new guest room! What a beautiful sanctuary you’ve created for you and your guests to enjoy. Everything looks perfect, well done! Thanks so much, Kaycee! I’m really happy with the way it all turned out. I used to hate walking into the space…now I love it. Thanks for following along. Happy weekend! I have been following along on this bathroom and closet adventure. I am happy to see how the room turned out. I knew i would love it and i do. It is so elegant and cozy at the same time. I love the colors and all the furniture. The blinds add the perfect touch. Looking forward to your studio space. Thanks so much, Julie! It’s been a very long process but I’m thrilled with the outcome. Thank you for your patience and for following our progress. I’m excited to finish so I can get to work on the studio. 🙂 Happy weekend! Would be s great place to read and chill out. It is a great place to read and chill out (I’ve already tested it). It’s such a great space to walk into now. What a nice, bright and cozy little area for your guest. They will love coming to see you now. I hope our guests like it. So much better than the mess that we used to offer. 😉 Thanks so much for stopping by, Marlene! I didn’t know that the bed is what brought you to the blog. So very glad you found me, Debbie. I really appreciate all of your support. Such an amazing transformation. I’m one who had questions about the closet and bath doors. I had even thought that possibly one door was used for both openings and only one area could be actually closed off at any time, but now I see how it works. You are great at problem solving and that is a trait that I’m sure has served you well. Also, I love that you used the platform bed from your previous house. I always thought that was so casual and practical for guest quarters, with its no headboard/footboard and basket storage uunderneath. Can’t wait to see what you do with your studio. 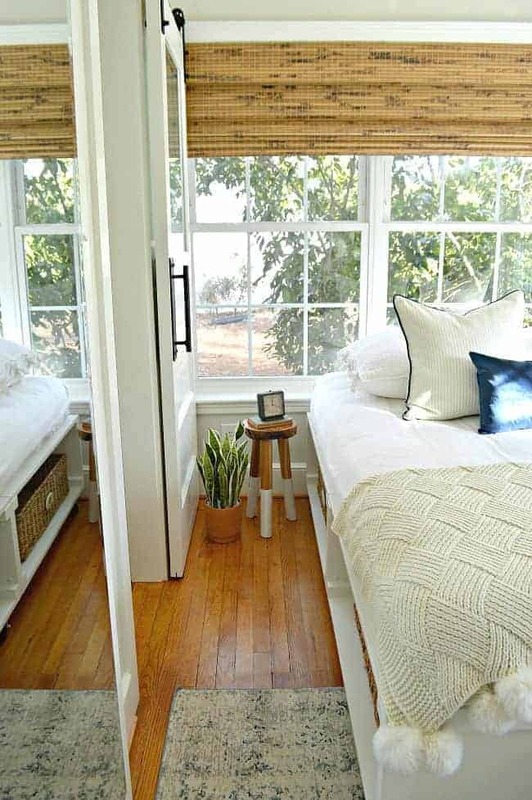 I have small bedrooms in my house and you have such great ideas to maximize the space. One final thing – I gave my daughter in law that same woven pom pom throw from Macy’s as a Christmas gift. She loves it. Thanks so much, Pat! I appreciate your sweet comment. I’m glad that my pictures and explanation gave you a better view of the sliding doors. I’ve gotten several emails asking about it so I was finally happy that I could share it. I’m glad that we could use the platform bed in here, too. I’d like to find some kind of very low profile headboard but I haven’t found anything to work. I’m still working on it. I love that pompom throw too. Such a great gift! What us the wallpaper? Great redo!! 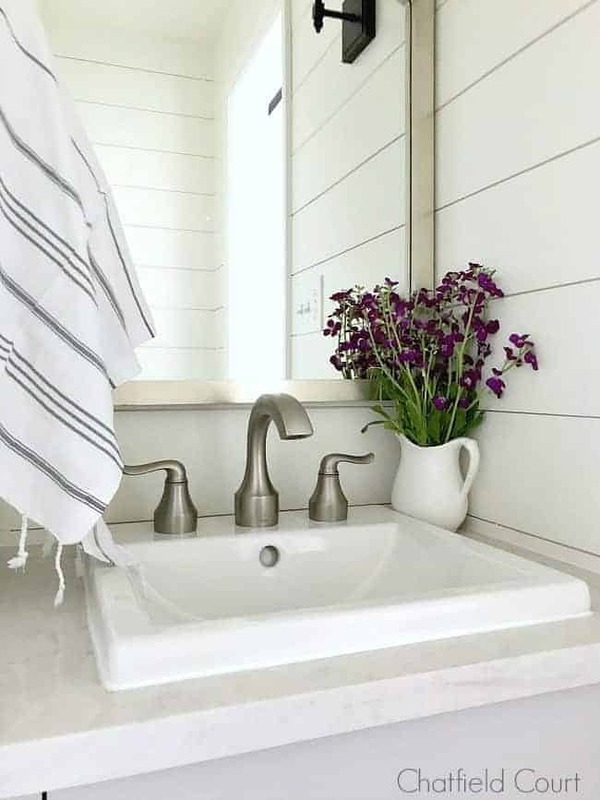 Love wallpaper source please but bath and close top of the list!!!!! Love your new guest bedroom. Very pretty. Looking forward to seeing your studio. So bright and cozy! Love it! I lovve this space!! Looks so fresh and inviting!